Two Dutch scientists are using algae to replace plastics throughout their city – and if their mission proves successful, they believe that no one will ever have to use plastic again. Lounging on the surface of uncountable numbers of lakes, ponds, seas, and riverways, are mats of aquatic vegetation called algae – and they use photosynthesis to take in carbon dioxide and release oxygen back into the atmosphere just like every other plant species. However, as useful as that function is to the planet’s survival, Dutch designers Eric Klarenbeek, and Maartje Dros have found another feature which could prove just as useful. They have developed a bioplastic made from algae which they believe could be used to replace synthetic plastics over time. Dros and Klarenbeek grow algae, which they then harvest, dry, and turn into a material that can be used in 3D printers to create plastic items from trash cans and tableware to shampoo bottles. 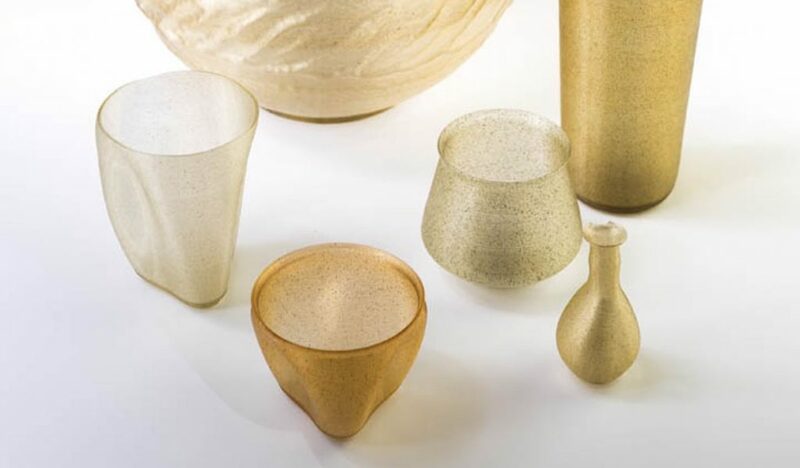 The designers believe that the algae polymer could entirely replace plastics made from fossil fuels, and they are kickstarting the transition by providing every restaurant and catering establishment in their city of Zaandam with completely new sets of flatware made from the algae-plastic. Their goal is certainly ambitious, but not when compared with the true dream of these remarkable designers. They have partnered with a number of other companies producing bio-polymer to create a network known as 3D Bakery. They hope that – instead of buying products from large multi-national companies – one could simply walk down the street and “bake” some replacement items, whether it be cups, plates, flower vases, or tables. Together with American company Ecovative, the studio has developed a commercial line of fungus-based products called Krown. The DIY kits allow consumers to grow their own lamps, tables or biodegradable picnic items. Another feature of the studio’s 3D-printed products is that because they’re made of algae, a substance which absorbs CO2 from the air, they internally bind with the carbon when they are turned into solids, effectively becoming CO2 jailers that prevent the carbon from being released back into the atmosphere. The designers believe that if algae were used to create the every day household products we depend on, the cultivation of algae would increase the amount of carbon being pulled out of the air; and considering the Earth’s surface is 71% water, algae mats wouldn’t take up essential land space. The algae project has been nominated as a finalist for the New Material Award of 2018. If it wins, then the team could be awarded up to $17,300 to continue development and manufacturing of the bioplastic. Judging by the pictures on the Krown website I wouldn’t want to buy any of those expensive products I don’t think I’d need to buy any of those things to help the environment. I don’t even believe 100% in climate change as a result of human pollution. However I like the Krown website and products. The first issue seems to be – is the CO2 just absorbed up to a certain point, and then the product becomes ‘done’ – if so how long is that ? I would be quite happy to buy products that were a continuing process, otherwise I need to know the time/amount of CO2 involved. I will not pay 20$ for something that is basically ‘done’ after 3 weeks ! It sounds like a good start to get rid of plastics. Thanks.